Some think that many sorts of animals serve as signs, omens, portents. In many cultures there is still a folk belief to reckon with along such lines. For example, a black cat that crosses the road in front of you means good luck - in England, that is. In other other countries it is not a sign of good luck. To avert the sorry goings that a black cat across the road might possibly presage, there are some tricks that lots of cramped people resort to, and there is also statistics. It may be possible to find out what natural signs mean by making out of them in retrospect. If, for example, a certain bird comes flying at you, is it an omen of something to mind? If so, an omen of what? Such things may be guessed at a long time afterward. Maybe we find connections, and maybe they are wrong. What does an animal represent to you? Astrology has made use of many animals in the zodiac ("circle of animals," "circle of life"), and let them represent sides to (the life of) being human. The animals are taken to represent this and that we may like or not. For example, the sign Leo (lion) does not stand for being bothered by hyenas and pestered by flies, panting in the sun and roving at night, attacking innocents. No, Leo stand for the "upside of the coin" - an impressive, fiery regal of a sort, and is related to areas or functions in the human body, human goings, and much else. Dr. Lewis shows by comments and quotes how Leo is perceived in astrology. Like the lions and kings of mythology (the sign is associated with royalty), Leos can embody some of the best as well as some of the worst of human traits. Sun in Leo . . . you live life on a grand scale wherever and whenever possible. Go to the zoo and have a look at the "King of the Beasts." He's lying there [a prisoner], one eye open . . . He is not genuinely introspective. Shyness and lack of self-esteem [may be] just as common. [Leo] may need more sleep than colder types. If you should meet a lion in the wild, is it a good sign or not? It depends. Besides, is it so sure that a lion is the very best animal to front the fifth star sign? The Chinese use the dragon there instead. Only the Ox (Taurus) is used as a shared sign indicator in both Chinese and Western astrology. The key is to study what the "totem animals" represent or symbolise: The Chinese symbol 'dragon' stands for strength. The lion is a strong animal.. There are common features among different symbols. In ancient civilisations, people gave meanings to different animals they had observed and spread stories about, aligning them to gods and goddesses in set ways. It shows up, as with Chinese and Western horoscope animals, that views differ. What or who animals are taken to represent, may not be found out so easily, as for example a frog in ancient Egypt might represent five gods and goddesses (check it below). Gods and goddesses change too - and are allotted new functions as centuries and millenniums go by. It often happens. It also happens that new gods push many older gods into the background. A little look into mythologies of the Norse, the Egyptians, and what happened to Vedic gods makes it apparent. An animal may be seen as representing itself too, not just gods, goddesses and imminent happenings (omen, signs). If the animal you chance to meet is an omen, what are you to it? Another omen, maybe. To Westerners, the owl traditionally represents wisdom. University owls reflect that use. To the Chinese, the own stands for stupidity. In ancient Greek, the owl was the favourite bird of the goddess of wisdom, handicraft, and warfare, Athena, who shows that goddesses and gods may have many strings to their bows (figuratively). Lakshmi is the Indian goddess of wealth and successful life. In the Indian state of Orissa, the goddess is associated with the white owl - taken as an omen of good luck and prosperity. Likewise, the owl is represented as the partner of her mate Vishnu, a major god in current Hindu mythology. To ancient Egyptians, the owl was associated with death. Ancient Egyptians believed that owls protected spirits as they passed from one world to another. And therefore the ancient Egyptians honoured the owl. It boils down to this: There is at times many alternatives to choose from, and many ideas that may not really fit in. The swan, (Sanskrit: Hamsa), is used as a symbol of divine attainment. Hamsa is made up of components that may be translated into "I am Me (He)", which at best is a facet of enlightenment. The Ramakrishna Society has found it fit to use the swan in the middle of their icon for that reason. Hamsa is for attunement with God the Creator - the master of all the beauty and grace in the world. In mythology it is also held that the swan can separate milk from water - hence discriminative activities originate on high, according to yoga too. The swan may be used as a symbol for a Godward turn. Bastet, the daughter and/or wife of the Sun god, became a national deity of Egypt in about 950 BC. She represents gladness, good fortune, music [cf. cat music and what violin strings are made of], dancing, healing, good motherhood, also protection by perfumes. Bast expresses qualities of the cat family, beauty of movement, caution and so on. Her major symbol is the sistrum, an ancient Egyptian percussion instrument. Also: the Uraeus, or Serpent of Wisdom. She also holds the ankh, a sistrum (musical instrument), or a papyrus wand. Cats, her sacred animals, were highly regarded in ancient Egypt. They also protected the grain from mice and rats. Families owning cats took care that they got due attention and respect. Killing a cat was punished with death. In the form of a boar (varaha), Vishnu brought the earth out of the waters into which it had sunk, and laid it on a lotus flower, and thus saved it. As the fish Matsya, God saved the originator Manu from the deluge and restored to Brahma (God) sacred texts that had been stolen by a demon. As the tortoise Kurma he acted as a pivot to allow the gods and demons to churn the ocean to get the nectar of immortality (Amrita). As a Lion-man he killed a boastful king and saved that king's pious child Prahlada. Vishnu saw it fit to change into a seducing woman too, on some occasion. Be that as it may, Hindus reckon with ten avatars (descents) of Vishnu, including these four first ones. Apart from this they also think of partial avatars, and then there are those persons who express divine qualities - Hindus call some of them avatars for that reason. Thus we have titles like "premavatar" (love-incarnation, i.e., divine love descended into flesh), "jnanavatar" (wisdom-incarnation, i.e., divine wisdom descended into flesh), and so on. Manu survived a Great Flood in Indian stories, and Deucalion and his wife Pyrrha did too, in old Greek tales. Deucalion and his wife Pyrrha were Greek survivors of the Great Flood He was the son of the Titan Prometheus, and married Pyrrha, the daughter of Epimetheus and Pandora. When Zeus decided to destroy the human race with the Flood because of man's wickedness, Prometheus told Deucalion to build an ark and stock it with food. The Flood came. Deucalion and Pyrrha floated in their ark for nine days and nights until it came to rest on the summit of Mount Parnassus. At last the rain ceased. They disembarked and made a thanks-offering to Zeus for their preservation. But now, as the only mortals left alive, it was their task to repopulate the world. On Zeus' instructions, they picked up stones from the earth and threw them over their shoulders. Deucalion's stones became men and Pyrrha's became women. Vahana is Sanskrit for "that which carries, that which pulls". The word is translated into 'carriage', and often denotes an animal or mythical entity that is used as a vehicle and a means of transport, such as a ship, a beast for riding, flowing and so on. There are many meanings of vahana, understood as a cerntain deity's "mount". Deities are often depicted riding or mounted on their vahanas. Have you ever seen someone with a human body and an elephant head ride on a mouse? A certain imaginative ability is called for, presumably. There is much imaginative prowess of Hindu portrayal. Thus, when Hindu gods are portrayed as having one or more vehicles, it represents something to ponder for those who care. In a world where old gods and various vehicles they are thought to use, are all around you, they could even sit on or ride on some of the creatures you see all around too . . . and "rise to the occasion". Three-headed dog Cerbura, the the three-headed infernal dog of the Krishna legend. Compare the Greek hell-dog Cerberos. A parrot vehicle of Kamadeva (passion). It can be associated with other gods too. Egyptian gods and goddesses are associated with animals in several ways, and for reasons that may be detected in ancient stories. Animals are given a reputation for being sacred by what they represent. So there is the sacred pig, the sacred frog and so on. Many Egyptian gods and goddesses are connected with the same type of animals, and many different animals are seen as manifestations of a deity or serve as intermediaries between humans and gods. Further, some gods and goddesses are depicted with the heads or other parts of animals. Ancient Egyptian depictions of many of them are found on Wikipedia. Thus, the god Thoth (Djehuty, Tehuty) is often portrayed as a human with the neck and head of an ibis bird on his shoulders. When a deity intervened in human affairs, it was said that the ba of the deity was at work. Ba is taken to mean the "impressiveness", "power", and "reputation" of a deity. Further, some species were seen as the baw (plural of ba) of the gods - for example, baboon for Thoth, crocodile for Sobek, cat for Bastet and/or Sekhmet, mongoose for Re, ram for Amun. In other cases, only one living animal at a time was presumed to be the representative of a god. The example: the Apis bull. Baboon: The dog-headed baboon - Allied: Thoth, the god of writing and recording; Khonsu, a youthful moon-god; Hapy, the son of Horus was depicted with the head of a baboon. Stands for: Eloquence, strength, fairness, responsibility. Cat: Allied: Bastet (Bast). Bast (Bastet). 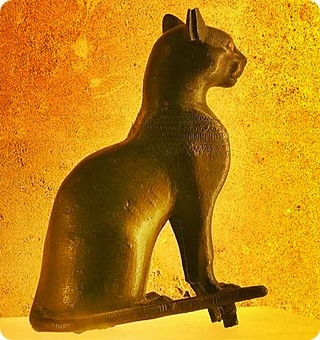 The sun god Ra, shown as 'The Great Cat of Iunu (On, Heliopolis)'. Stands for: Protector, defender, fertility, offspring, childbirth. Cow: Allied: Hathor, Isis, Nut, Mehet-Weret, Bat. Stands for: Female fertility. --- The cow also symbolised the pharaoh's mother (while bulls represented the pharaoh). Cobra: Allied: The cobra goddess Renenutet, Wadjet. Stands for: Justice, fertility, protection, royalty (protection of the king). Crocodile: Allied: Ammut, a demoness; the deity Sobek; Taweret, a hippo goddess of birth. Stands for: Justice, power, respect. Falcon: - Allied: Horus; Montu; Socar. Stands for: Royalty, protection, strength. --- In depictions, there was often a falcon with outstretched wings hovering over the head of the pharaoh. Frog: Allied: the goddess Heget (Hequet), often shown as a frog-headed woman or as a frog. Stands for: Fertility and resurrection, and childbirth. Four male primeval gods - Nun (water), Amen (invisibility), Heh (infinity) and Kek (darkness) - were all frog gods. Goose: Allied: the god of the Earth, Geb; his daughter Isis; the god Amon. Stands for: Strength. --- Geb, 'The Great Cackler', laid the egg from which the sun was hatched. His laugh was also thought to create earthquakes. Heron: The Egyptian heron was thought to be the original phoenix, and thought to be the Ba of both the sun god Ra and Osiris. Hippopotamus: Allied: Set, Ammut, Taweret. Stands for: Strength, protectiveness, justice, benevolence (female hippos), the household. --- The male hippopotamus was thought to be an evil animal. The female hippopotamus, on the other hand, was considered the manifestation of Taweret, the benevolent hippo goddess of fertility and childbirth. Lion: Allied: Aker; Shu; Tefnut; Hathor; Wadjet; Mut; Maahes; Sekhmet; Nefertem; Shesmu; Apedemak; Bes. Stands for: Strength, leadership, royalty, ferocity, war, healing, beauty. Ostrich: Goddess: Ma'at Stands for: Order. --- In ancient depictions, an ostrich feather as headwear is a sign of Maat. Pig: God: the god of chaos, Set; the goddess of the sky, Nut Stands for: chaos, sacrifice, sight. The sow, however, was identified with Nut. She was depicted having the teats of a sow, ready for her children to suckle (and a water jar as well. Ram: God: Khnum (an equivalent of the ram-god Banebdjedet); the fertility god Keryshef; Amun, who also had a ram form, though this was a different species of sheep . . . Khnum was thought to be the creator of human bodies from clay on his pottery wheel. He later was described as Divine Potter and Lord of created things from himself. Stands for: Fertility, strength, birth. Scorpion: Allied: the scorpion goddess Serqet; Shed, a god known as 'the saviour', Tabitjet. Stands for: Poison and protection; prevention and cure; virginity. --- The scorpion was sacred to goddess Isis, who was thought to have been protected by scorpions while her son Horus was young. Snake: Allied: the water-snake demon Apep of the underworld; the four primeval goddesses Naunet (water), Amaunet (invisibility), Hauhet (infinity) and Kauket (darkness); Nehebkau. Stands for: danger and cure. Vulture: Allied: Nekhbet, goddess of Upper Egypt; the mother goddess Mut. Stands for: eternity; monarchy, leadership; protection to the pharaoh. Barbara, Hannah. 2006. The Archetypal Symbolism of Animals: Lectures given at the C. G. Jung Institute, Zurich, 1954-1958. Ed. David. Wilmette, IL: Chiron Publications. Hart, George. 2005. The Routledge Dictionary of Egyptian Gods and Goddesses. 2nd ed. Abingdon, Oxon: Taylor and Francis. Herzberg, Birgit. 1997. Hva ler vi av? Om nordmenns forhold til humor. (What do we laugh at? On how Norwegians relate to humour). Oslo: Pax. Jordan, Michael. 2004. Dictionary of Gods and Goddesses. New York: Facts on File. Lewis, James R. 2003. The Astrology Book. The Encyclopedia of Heavenly Influences. 2nd ed. Canton, MI: Visible Ink Press. Lurker, Manfred. 2004. The Routledge Dictionary of Gods and Goddesses, Devils and Demons. London: Routledge. Reissue. March, Jenny. 2001. Cassell's Dictionary of Classical Mythology. London: Cassell and Co.
Remler, Pat. 2010. Egyptian Mythology A to Z. 3rd ed. New York: Chelsea House.